MONDAY, 20 JUNE – Senior Lecturer from the Faculty of Business, Economics and Accounting (FPEP), Universiti Malaysia Sabah (UMS), Dr. Awangku Hassanal Bahar Pengiran Bagul has been appointed as an Advisory Committee to the International Sustainable Campus Network (ISCN) for a period of two years starting June 2016. The appointment has made UMS the first Malaysian university to be appointed to a committee consisting of 20 ISCN members from among world’s leading universities. According to Dr. Hassanal, the committee agreed to act as a think-tank for world campus sustainability, based in Zurich, Switzerland. 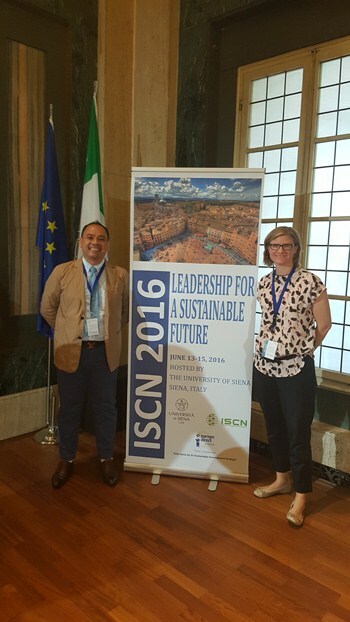 “One of the main tasks of all elected members includes the setting up and leading organisational development and programme content of ISCN,” he told reporters when met after attending a three-day meeting of the Advisory Committee of ISCN at University of Siena, Italy recently. Dr. Hassanal also expressed his appreciation over his appointment and extremely proud that ISCN recognised UMS as a sustainable campus with global standing. “Executive Director of ISCN, Zena Harris also conveyed her felicitations to UMS and hopes that UMS will work hand in hand with ISCN to be innovative and inclusive at global level through the establishment of the ISCN Advisory Committee,” he added. For the record, UMS was also the first university in Malaysia to be accepted as a member of ISCN in 2014 as part of the EcoCampus initiatives.